Executive Coffee Service offers only the most modern, state-of-the-art vending equipment. We do not lease or charge you to have our vending machines at your location. These bright and sleek machines are a welcome addition to any breakroom, employee lounge or cafeteria. 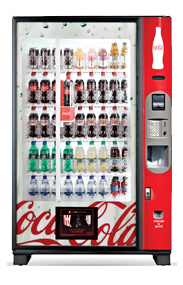 We offer Pepsi and Coca Cola beverage vending machines fully stocked with the most popular cold beverages. From the traditional soda mainstays to healthier alternatives like water and juices, our cold beverage vending machines have options sure to please any palate. 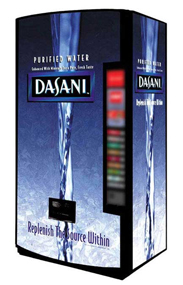 We carry a wide variety of modern reliable vending equipment including glassfront, can machines, Gatorade machines, Snapple Machines and even generic machines that can sell both Pepsi and Coke products. 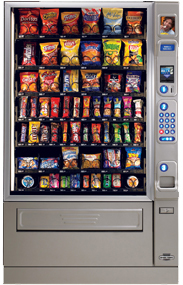 Our snack machines deliver more variety, giving your consumers the new flavors, healthy snacks, and new products they demand. With 50% more selections than conventional snack merchandisers, we can provide the right quantity and product mix to satisfy the unique preferences of any location. With more selections, new styling, and an enlarged glass front window, our snack machines deliver a wider variety of products in a fresh, new way that keeps your employees coming back for more. An optional bill recycler that accepts and pays back bills, sets a new standard for consumer convenience. Save your business the hassle of dealing with annoying services calls, failed vends and frustrated consumers by choosing Executive Coffee Services. Crane's lastest sensing technology, SureVend, guarantees that consumers get their product or they get their money back. With an 80-year legacy, the Crane National Vendors brand is renowned for superior durability and reliable operation.